hello dears! 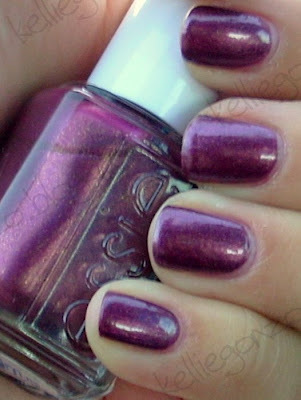 i got essie it's genius for a slight discount at trade secret so i was stoked to try it out. it looks simply grand in the bottle, rich aubergine purple with gold shimmer oooh! and it was gorgeous in both natural indoor light and outside in the hot western sun. however, i had to screw it up internally. this mani never had a chance. the whole tip wrapping thing and me just isn't gonna cut it i'm afraid, kids. at least until i find a better technique. because, like i said, i really don't mind a little tip shrinkage. i just don't. also, probably more importantly, my base coat cocktail this time around was simply too thick and messed it up, so DON'T try this combo at home!